Are you looking for a lawyer that keeps up to date with the latest family law developments? Or are you a family lawyer wanting to be a better family lawyer? Or are you a self-represented litigant looking to the get the best out of your case? Whatever your situation, we have some tips below from a Family Court Judge on what you can do to assist a Judge in Court. 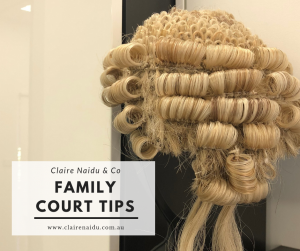 These tips are helpful for those wanting to choose the best family lawyer and what you should look for, the tips are helpful if you are a lawyer in family law, and they are also of assistance for those people who are wanting to represent themselves in court, without a lawyer. ..Legal practitioners owe their first and fundamental duty to the court and the administration of justice. Much can be done by them – and consistent with their duty should be done by them – to assist judges faced with the issues just referred to. Clear and precise identification of the nature of the proceedings; their basis in statute and decided authority and, crucially, the issues to be decided expressed succinctly and cogently, should be the rule, not the exception. There should be a clear understanding of what the Act and authority dictates as to the nature of the relevant judicial determination and the limitations inherent in the relevant process. The passage from Goode quoted above has particular resonance. Concise, accurate and cogent references to agreed or uncontentious facts and less contentious matters must form the parameters of what is argued and sought by way of orders. Draft orders should always be provided and, rather than being produced by rote, should reflect the evidence and the inherent restrictions just referred to. Far too often draft orders, when indeed they are provided, do not reflect that appropriate thought has been given to whether the evidence, confined in the manner earlier described, justifies any such order. All too frequently orders are sought for which there is no evidentiary foundation at all. The matters just referred to should, as a minimum, be reflected in a document for the judge. This is by no means to suggest a lengthy (and consequently expensive) document – in the vast majority of cases such a document, much of which could be in dot point form, can be confined to a page or two. Tip 5: Wisely use your time! Time spent waiting for a hearing – or indeed the days ahead of a hearing – can be used productively by exchanging such documents and agreeing upon the very same uncontroversial facts and truncation of issues that can, and should, be dealt with in the necessarily confined interim process. Importantly, a practitioner’s primary duty to the court and the administration of justice includes assisting the judge by helping to identify and crystallise issues, evidence and the like when a party is self-represented. That is not a duty exclusive to, or confined to, the ICL. To see the whole decision: Click here. To obtain family law advice from family law specialists: Click here for our contact details.